Residents of New Fairfield are invited to a legislative forum on Monday, February 25 to learn about the true scope of financial hardship in Connecticut and to participate in an in-depth discussion on strategies to help ALICE households achieve financial security. Six years ago Connecticut United Ways committed to shining a light on households that, despite working hard, live paycheck to paycheck and are unable to afford life's most basic necessities such as housing, food, child care, transportation, technology, and healthcare. We call these households ALICE, an acronym that stands for Asset Limited, Income Constrained Employed. 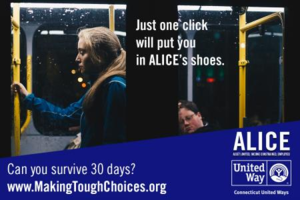 New Fairfield residents can learn more about ALICE by visiting United Way of Western Connecticut, or calling (203) 792-5330. According to the 2018 Connecticut United Ways ALICE Report, Connecticut's 3rd ALICE Report, 40 percent of Connecticut households are unable to make ends meet. Of this 40 percent, 30 percent (404,035 households) have earnings above the federal poverty line but below a basic cost-of-living threshold known as the Household Survival Budget. "The 2018 ALICE Report confirms that a significant number of Connecticut's working families live under real financial strain, sometimes only one unexpected event away from distress" said Steven Hernández, Executive Director, Commission on Women, Children and Seniors, and Commission on Equity and Opportunity. "On February 25, we will bring together policymakers, researchers, business leaders, community providers and ALICE families to discuss how we can better serve those who struggle to make ends meet." The event will run from 1:00 p.m. to 3:00 p.m. in Room 2-E of the Legislative Office Building (LOB), at 300 Capital Avenue in Hartford. Coffee and light refreshments will be offered in the 2nd Floor Atrium prior to the event from 12:00-1:00 p.m. The forum is free and open to the public, though anyone planning to attend is asked to register at: http://bit.ly/ALICE2019. "ALICE households are vital to our state's economic well-being, and we all know and depend on ALICE," said Richard Porth, President and CEO of United Way of Connecticut. "The ALICE legislative forum provides an opportunity for people who care about ALICE to think together about short-term and longer-term strategies that can lead to opportunity and financial stability for ALICE households." Connecticut United Ways identify and build upon strengths and assets in their local communities, helping individuals and groups find ways to contribute their time and talents, support direct-service programs and community-change efforts, and advocate public policy changes toward advancing the common good. Connecticut United Ways advance the common good by creating opportunities for all, with a particular focus on education, income, health, and basic needs - the building blocks for a good quality of life. We engage people and organizations throughout our communities who bring passion, expertise and resources needed to get things done, and we invite everyone to be part of the change.